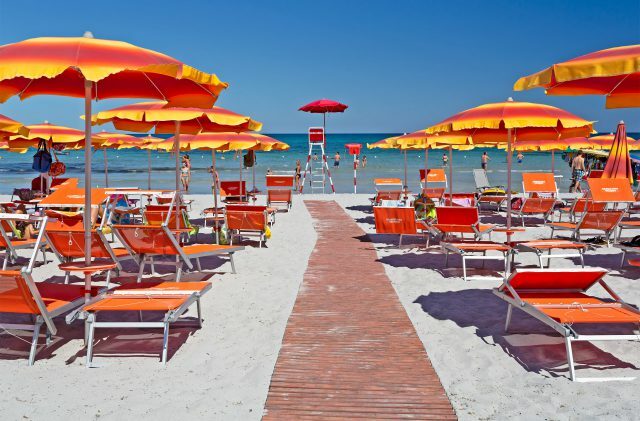 You can hire sunbeds and parasols at Cala Ginepro on the fully equipped beach, which can be accessed directly from the campsite by means of a walkway (it starts directly opposite the bar). The equipped area occupies just one part of the beach, next to the spaces that can be used free of charge by both guests and visitors. The beach service is active from the month of June until the end of September. The sun loungers and parasols, which are free for those staying in our mobile homes or bungalows, can be hired by all guests at Reception. Every parasol is fitted with containers for cigarettes. Cigarette ends take up to 12 years to decompose and they pollute the beach and the sea. Moreover, they are dangerous for children, and highly toxic for fish and, therefore, for our diet. If you do smoke, we would ask you to use these specific containers, in order to respect both people and the environment.